This is It! BBQ menu prices for one of the premier barbecue and soul food restaurants in existence throughout the Southeast (and beyond). The restaurant menu features classic, southern dishes which are skillfully made and meet the demands of even the most discerning food lover. We’re not just saying that either. In 2011, they were recognized by Steve Harvey and won a Hoodie Award for The Best BBQ. Don’t tell grandma, but this food is BETTER than she used to make! Plus it’s convenient if you live or are visiting the Atlanta area, you’re never too far from great bbq. There are nine locations in the metro area. Check out all the soul food goodness and how much it will set you back on our This is It! menu with prices below. It’s no wonder this restaurant was successful since it’s founder grew up working in his parents’ diner in Tampa, FL and had already founded and sold another successful restaurant concept prior to starting this one. 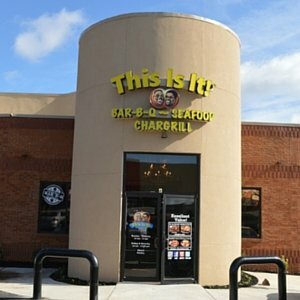 Over the years, This is it has expanded their menu include selections for breakfast, lunch, and dinner to meet the increasing demands of its loyal customers. A note about breakfast: Be sure to check the location first as breakfast is not served at every location and is only available when you call ahead to make arrangements. This restaurant is so loved for its high quality, “never frozen” food that it’s received wide recognition from the likes of CNN, Fox News, and the Atlanta Journal-Constitution. In addition, it has received many celebrity endorsements including a recent endorsement from famous Atlanta native and talented quarterback of the Carolina Panthers, Cam Newton. The iconic restaurant has been in business for over 30 years! It was founded in 1983 by Shelley “Butch” Anthony. He had the goal of recreating the authentic flavors of his childhood, in an atmosphere where customers were treated with sincere appreciation. About the Founder: As a result of his personal character, hard work, and achievements. Mr. Anthony has won multiple awards and has even had a day named in his honor. Butch spends a good portion of his time today sharing his story and his knowledge with others through public speaking engagements. He’s clearly a religious man, as he has chosen to close his restaurants on Sunday in order to encourage his employees to spend the day at church and with their family. Hours: Each location is open daily (except Sunday) at 10:30 am and closing times vary by location and day. Most are open until 11:00 pm Monday through Thursday and until 12:00 am Friday and Saturday. Holidays: Corporate locations are closed on Christmas day. However, they are open on Thanksgiving & Christmas Eve. Discounts: This Is It! has a very generous with their discount policy. Tuesdays are the senior discount day. People 55 and older get 10% off meal their meal. On Wednesday, veterans, state & federal employees also receive 10% discounts. Please be sure to bring your ID in order to receive the discount. Delivery: Delivery service is available on the catering side of their business. This is It! will deliver for no additional cost, within 5 miles on catering orders of more than $150.00. Rewards Program: This is It! BBQ started their current rewards program in 2014. By signing up, loyal diners will receive 1 point for every dollar they spend. Points can be redeemed at any corporate store for anything on the menu. What’s Next? : The company announced last year that they would be expanding their reach by offering franchise opportunities. Anyone interested can visit the restaurant to find out more. For more information about This is It! BBQ, visit their website.